Issue Tracker - Issue #103: Possibility of creating Layer type attributes. Possibility of creating Layer type attributes. Issue: Possibility of creating Layer type attributes. Currently, I am using a number attribute or a text attribute as a reference of the ID/name of the desired layer. What benefit would having a "layer" attribute give you over text and numbers? 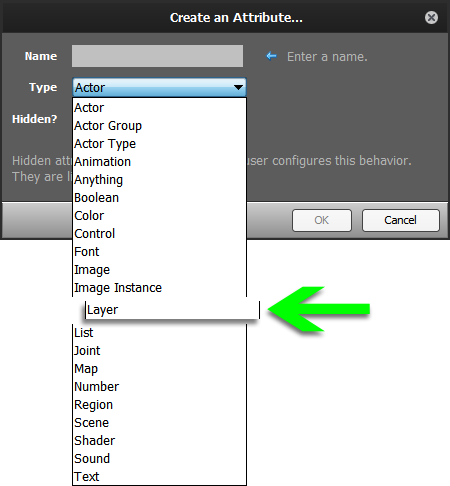 Is it so you can select a layer from the layer pane itself in the behavior settings? I guess if we did this, a "layer" attribute would actually be a number and it would be used in the "with ID" layer blocks. Yes. I have made a Scene Behavior for a client, and he has asked me this feature. He wants to select in the Behavior settings the layer on which the actors will be spawned. Therefore, I assume that, for novice customers, it would be easier and clearer to directly select the desired layer from the layer pane itself in the Behavior settings instead of manually typing the ID number or the name of the layer. Also, I guess it would be less prone to mistakes for customers.